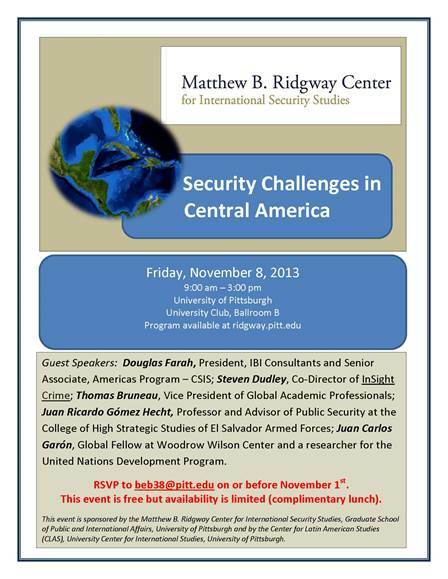 Don’t forget to RSVP to Bev Brizzi at beb38 [at] pitt.edu by November 1st to ensure your spot at the Matthew B. Ridgway Center’s “Security Challenges in Central America” event on Friday, November 8th from 9:00 – 3:00 at the University Club, Ballroom B! A complimentary lunch will be provided! This entry was posted in Upcoming Events and tagged Central America and Mexico, Latin America by grick. Bookmark the permalink.